Alessandra is an associate in the personal injury group at Rochon Genova LLP. Before joining the firm, Alessandra articled and practiced with a prominent personal injury firm in Niagara. 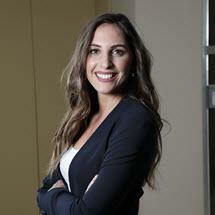 Alessandra holds an Honours Bachelor of Arts degree in Communication Studies from Wilfrid Laurier University. During the third year of her undergraduate studies, she was selected to participate in the Wilfrid Laurier International Exchange Program and attended Univsersité Paris Dauphine on academic exchange. Alessandra holds an LL.B (Honours) from the University of Leicester. While in law school, she was an active member of the University Mentoring Program, the Canadian Law Society, and was a finalist in the Law School’s Client Interviewing Competition. Prior to law school, Alessandra counseled and facilitated workshops for at-risk youth in the Employment Programs and non-Residential Attendance Centre Program at the John Howard Society. She also volunteered with the Ministry of Community Safety and Correctional Services and served on the Board of Directors of Community Living Grimsby, Lincoln and West Lincoln. Alessandra enjoys the outdoors, is an avid yogi and enjoys exploring Toronto’s eclectic food scene.